I think most secular holidays are artificial attempts at reintroducing seasonal meaning into the calendar after our Protestant forefathers destroyed the Roman Catholic liturgical calendar, which had adequate celebrations throughout the year to help sanctify the time, but Thanksgiving* is an eminently beautiful and even Christian holiday, and I have always enjoyed it, especially because we bring food to share, and don’t stress about gifts on this blessed day. 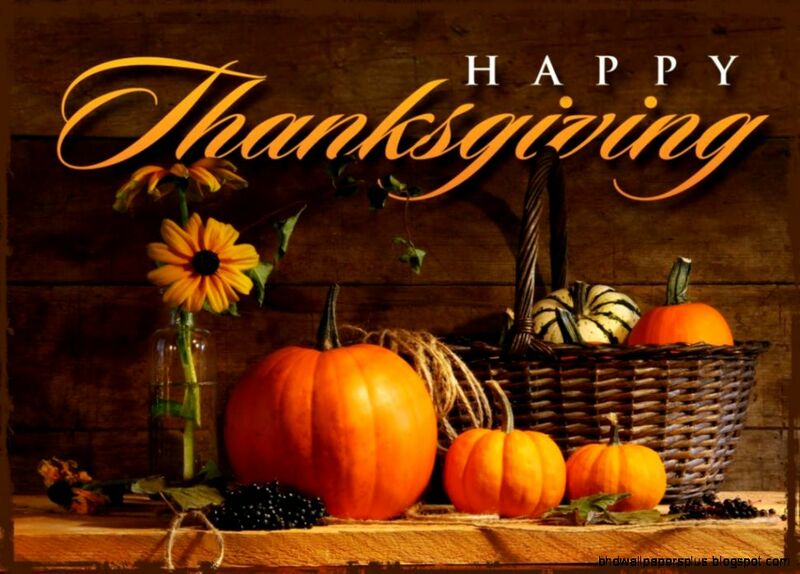 I am thankful to all of my family and friends; those who have stuck by me all these years, and those whom I’ve recently met. May those of you reading this who celebrate American Thanksgiving enjoy your day. May the rest of you all around the world have a peaceful Thursday. I love you all! (* Thanksgiving seems to be the American secular equivalent of the Feast of Michaelmas, from what I can gather). Formerly, such deception was common among Roman Catholics and Anglicans, where “independent” clergy would pose as Roman Catholic or Anglican bishops or priests, but as the Internet has helped weed out such imposters, they have taken their game to the Orthodox “scene,” where the lack of information available and the perceived exoticness of Orthodoxy has allowed them to have moderate success. In more recent times, they have even taken advantage of the schism between traditional Orthodox Christians (Genuine Orthodox Christians [GOC] or Old Calendarists) and the New Calendarist, Ecumenist heretics, in order to present themselves as traditional Orthodox Christian clergy who are separate from the “official” and “canonical” New Calendarist/Ecumenist Churches due to reasons of faith, rather than due to canonical infractions, scandals, lack of qualifications, or self-will. They are “Genuine Orthodox” in name only, but are able to manipulate the faithful with their sophistry. Due to this confusion, I intend to begin a series of posts on this blog categorized as “Traditional Orthodoxy in Latin America.” A thorough analysis is needed, and many sub-topics can surely be explored, but for the time being, I will present one historical document and several contemporary links to photos demonstrating a link between the Church in Greece and the Church headquartered in the United States (which has jurisdiction over Latin America) due to a pressing request by our priest living in Colombia, the Rev. Fr. Félix Piñeros, pastor of St. Nectarios of Aegina Mission Parish in Bogotá, Colombia, who left the New Calendarist Church only to find himself in an uncanonical, pseudo-Old Calendarist jurisdiction, and finally made his way to canonical Orthodoxy some years ago. If you are reading this post and have further questions, please leave your comments in the section below, so I can consider them for future posts in this series. In an English-speaking context, church websites which advertise their origins and apostolic succession are generally automatically assumed to be spurious. No legitimate Orthodox jurisdiction would need to defend itself by posting a lineage on a website; those who do so are often defensive and trying to establish themselves based on legal arguments of “who ordained whom”; arguments which are foreign to the Orthodox view of apostolic succession and ordination. 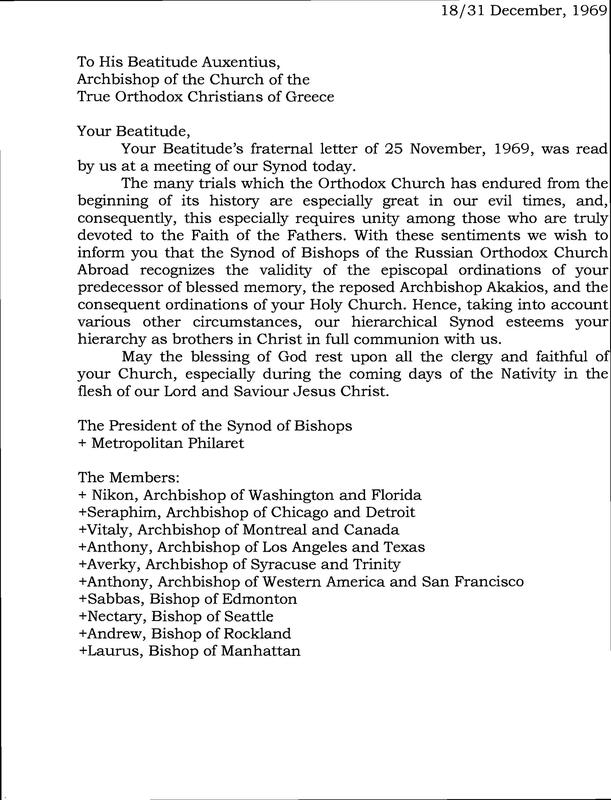 Your Beatitude’s fraternal letter of 25 November 1969, was read by us at a meeting of our Synod today. The many trials which the Orthodox Church has endured from the beginning of its history are especially great in our evil times, and, consequently, this especially requires unity among those who are truly devoted to the Faith of the Fathers. 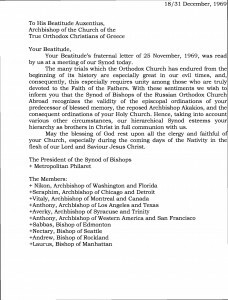 With these sentiments, we wish to inform you that the Synod of Bishops of the Russian Orthodox Church Abroad recognizes the validity of the episcopal ordinations of your predecessor of blessed memory, the reposed Archbishop Akakios, and the consequent ordinations of your Holy Church. Hence, taking into account also various other circumstances, our hierarchical Synod esteems your hierarchy as brothers in Christ in full communion with us. May the blessing of God rest upon all the clergy and faithful of your Church, especially during the coming days of the Nativity in the flesh of our Lord and Saviour Jesus Christ. Τὸ 2012 ἐνετάχθη εἰς τὴν κανονικὴν Ἐκκλησίαντῶν Γ.Ο.Χ. ἀκολουθούμενος ἀπό ἰκανόν ἀριθμόν Κληρικῶν, Μοναχῶν καὶ Ἐνοριῶν ἐκ διαφόρων περιοχῶν τῶν Ἡνωμένων Πολιτειῶν Ἀμερικῆς καὶ ἀνέλαβεν τὴν Ἐπισκοπὴν Βοστώνης. Τὴν 6/19 Φεβρουαρίου 2014 ἐξελέγη Μητροπολίτης Ἀμερικῆς καὶ ἐνεθρονίσθη τὴν Κυριακὴν 18-4 / 11 – 5 – 2014 παρουσίᾳ, ἐκτὸς τῶν Ἀρχιερέωντῆς ἱερᾶς Ἐπαρχιακῆς Συνόδου Ἀμερικῆς καὶ τῆς Ἀντιπροσωπείας τῆς ἘκκλησίαςΓ.Ο.Χ. Ἐλλάδος καὶ ἐκπροσώπων τῶν Γνησίων Ὀρθοδόξων Ἐκκλησιῶν Ρουμανίας καὶ Ρωσικῆς Διασπορᾶς. In 2012 he entered into the canonical Church of the G.O.C., with a sufficient number of Clergy, Monastics and parishes following him various areas of the United States of America and he undertook the Diocese of Boston. On February 6/19, 2014 he was elected Metropolitan of America, and was enthroned on Sunday April 18/May 11, 2014 in the presence of the hierarchs of the Eparchial Synod of America, and representatives of the Church of the G.O.C. of Greece, the Church of the G.O.C. of Romania, and the Russian Orthodox Church Abroad. 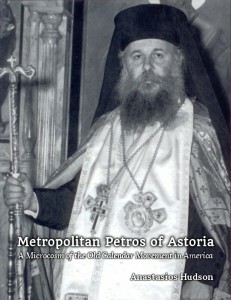 The aim of this brief post is to outline the present situation regarding Latin American Orthodoxy, demonstrate the link between the present Church of the Genuine Orthodox Christians and its origins in the Russian Orthodox Church Outside Russia, and the continuity between the bishops of the Church of Greece and the local Church of America (both North and South). Further posts in this series will delve deeper into the issues mentioned, but my concern now was to answer the immediate questions of one of our clergy. Please pray for us and our mission! For one thing, the “Christmas Season” starts earlier and earlier each year (for shopping purposes). So, I guess the real war is on Advent (the season of preparation)! Either way, the people participating in these “wars” are doing so voluntarily. I’ve been working on several website projects in the evening, and as a result, have had little time to write. However, writing is my passion and something I want to do regularly, even if I am stretched thin with other obligations. For this reason, I am planning to set a schedule of one post every three weeks here for the rest of 2015, on Tuesdays. Please subscribe to the site in order to be notified of each new post. The video was well-produced, slick, and I can see how the target demographic could be swayed by such (disgruntled youth lacking focus/direction who have found what they consider a “righteous” cause that speaks in black/white and absolutes). For instance, in order to set the stage for the gruesome murder, they constantly showed video footage of bombed-out locations with dead people and destruction, then flashed back to video of the pilot, in order to imply that he was a murderer and thus deserved to die. The site selected for the murder appeared to be a place that had previously been bombed. As the victim was being murdered, a type of Islamic chanting began to play in the background, which picked up in pace and was hypnotizing in nature. The editors of this video know how to lock the images of the video into the mind permanently, I will give them that. The hues of the ISIS militants’ fatigues and clothing matched the desert, whereas the unjustly-condemned victim’s orange jumpsuit suggested non-belonging, creating an us-vs-them feel, an unnatural feel. The man was placed in a cage, like an animal. That being said, that was not my takeaway from the video, nor the reason I decided to jot down some reflections. Above all, what struck me was how dignified the victim looked during the whole process. He seemed to walk willingly to the cage, and stood there peacefully as they lit up the charge. He only began to move frantically when the flame reached him. I wondered about this—I’m not the physically strongest fellow out there, and I wonder if I would be screaming like a girl the second I saw the torches, or they doused me with gasoline. He walked calmly to his cage; the other hostages murdered in other videos likewise read statements calmly, etc. Is it brainwashing? Fatigue? Depression? A hope that it will “go easier” if they cooperate? Or perhaps threats against their family members? Still, one would expect to see frantic desperation, and if such existed, one would assume that ISIS would highlight it, in order to paint the victim as a coward (unless I am misunderstanding something about Arab cultural norms and perceptions; add your comment below if you can shed light on that). Instead, what I saw was a man who stood with dignity and patience, a hero who rested on the fact that he had served his king and country honorably, who faced his fate with courage, calmly and dispassionately. The result for me was a deep respect for this fallen comrade in the fight against evil. ISIS may have tried to use him as propaganda, but in the end, they only made themselves look like fools. This man stood without a veiled face, while the cowards of ISIS killed him without even looking him in the eye, or showing their faces. 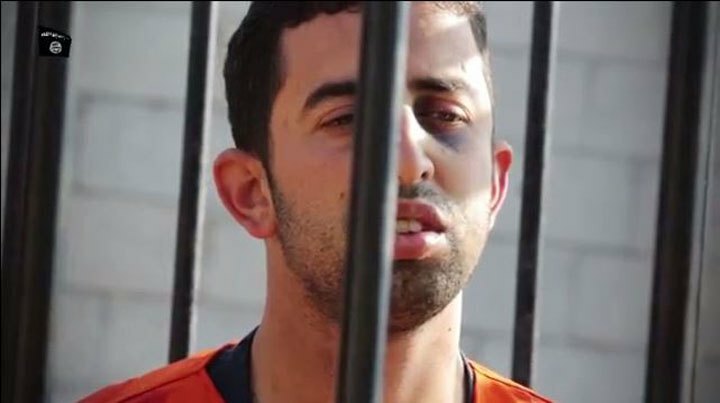 Lt. Muath al-Kaseasbeh, Muslims such as yourself believe with us Christians that Jesus will judge at the end of time, despite your rejecting the Christian belief in His Divinity; I pray that when you encounter Him Whom you considered a mere Prophet, you will be bathed in His light, forgiveness, and mercy, and that somehow you will be granted Paradise on that great and fearsome day. Thank you for inspiring me with your courage and dignity. May your widow and family be granted peace, and may your death be avenged. As an Orthodox Christian, I hope that such avenging is by the conversion of the hearts of your murderers, but barring such, then by their swift destruction. (Originally posted on my personal Facebook page). 1. I am proud to have finally stopped drinking soda completely, after being addicted to it for 26 years. 2. I am proud to have basically stopped drinking hard liquor, and cutting my beer consumption in half–although when you drink as much beer as I do, that means I still have a long way to go, and it is clearly a struggle. 3. I am proud to have been able to complete my VCP5-DCV certification–even though I did not get a raise, promotion, or new job because of it. But knowledge is knowledge. I have faith this is a step in the right direction. 4. I am thankful that I have reached a certain “working understanding” in my personal relationships with various people; in other words, things are more peaceful and productive. My mother and I have a much-improved relationship. You-know-who and I rarely argue anymore. The stresses of integrating two families under one roof have mostly subsided. I have reconciled with some people who were hurt by my actions in 2012-2013. 5. I am thankful that I have a place to live, food to eat, a car to drive, and clothing. 6. I am thankful that I have not run out of money, despite being in a certain career limbo. 7. I am blessed to have health, family, and friends who love me. 8. I am blessed to be a part of the Orthodox Church, without which, none of the above would be possible. If you are considering your faith and your relationship with God, ask me what the Orthodox Church has done for me and what it can do for you. I’d be happy to share my experience. I could go on and on, but I am being a bit narcissistic here, so I will stop. I love you all very much, and thank you for your friendship and support. Facebook may be a waste of time in some sense, but I do appreciate how it has helped me maintain family relationships and friendships with so many people. I appreciate being able to share (perhaps overshare) my stuff, and trust me that I like reading about you and your lives too. The following question was recently posed to me on my personal Facebook page, by a Ukrainian friend of mine, who is a college professor. Dear Anastasios… Just what do you think about the current status of, and what do you think about, this “Russian Orthodox Church?” You see, I’ve known you “virtually,” in “cyber space,” and what not, for are a number of years… But now, what do you think, really? I have long avoided answering such questions on my Facebook page, because I have a mixed group of friends and hate engaging in polemics and controversy. That’s not to say that I would change my actual beliefs based on whom I am speaking with—that would be duplicitous—but rather, that I tend to avoid such discussions altogether, because the work that has to put in to crafting an honest but dispassionate and sufficiently polite response borders on onerous. I don’t like offending people, or upsetting them—to a fault, perhaps. I prefer to write about what the GOC (Church of the Genuine Orthodox Christians/”Old Calendarist Church”) stands for, versus what it is against, especially since there are so many people already doing the latter; but since you pose the question, I feel obligated to answer openly and forthrightly, despite my aversion to polemic and debate. With that loquacious disclaimer out of the way, let me try to answer your question. I have to make a distinction between the “Russian Orthodox Church” on the one hand, and the “Moscow Patriarchate” on the other. The Russian Orthodox Church is a mostly venerable institution; after the conversion of St. Vladimir in 988, it was a regional organization of bishops in Kiev and later, after the Mongol destruction of such, Moscow, subject to the Patriarchate of Constantinople. By the 16th century, it was independent and self-governing, taking its place alongside the four ancient patriarchates (using as a precedent the independent ecclesiastical administrations in Serbia and Bulgaria). It grew and expanded across the East, to Siberia and then beyond, and established itself even in the far East and Central Asia, through the endeavors of such saints as Macarius of Altai, Innocent and Herman of Alaska, and Nikolai of Japan. With these positive achievements, however, came certain downsides. The suppression of the Georgian Patriarchate (1811) is illustrative; where the Russian Empire expanded, the Moscow-controlled church administration expanded (as opposed to the Orthodox faith per se). After the fall of the empire, brief attempts at creating autocephalous churches in the newly-freed areas such as Ukraine were crushed when the Red Army retook these areas. I have to say that I am against ethnic-based churches on principle, so the idea that there has to be a national church in each country is something I dislike; I would prefer to see exarchates, dioceses, or metropolitanates based on territory and tied to one of the original patriarchates. The Georgian Church is a good example of the way it could have been: the Georgian patriarch was originally called a Catholicos, and he was sort of a junior patriarch to the patriarch of Antioch, and his election had to be confirmed by him and his synod. I would have preferred to have seen the national churches that developed in Europe have been catholicosates under the Patriarchate of Constantinople instead of full-fledged patriarchates; unfortunately, nationalism being what it was, this was impossible to deal with from an ideological standpoint, and political and practical considerations ruled. Now, we even have the abhorrent, uncanonical, and disastrous practice of each national church even setting up exarchates for its members in other countries, such that there is now a Serbian administration in Romania and a Romanian institution in Serbia. The attempted Romanian incursion into Jerusalem was stopped, however, when the Jerusalem Patriarchate broke communion with the Romanian Patriarchate until they backed down. This sort of behavior leaves me with a bad taste in my mouth. Given that each national church was made autocephalous as it became independent, however, means that a precedent has been set (even though the Canonical Tradition does not technically take precedent into account as it is not based on Common Law, people are still human and cite prior examples). As such, I don’t see how it’s really fair for Ukraine to not be autocephalous by this point, and I think it will eventually happen, no matter what Moscow says. Now that I’ve addressed the question of the Russian Orthodox Church from the perspective of history and the development of national churches, I will turn to the point of how I see the Moscow Patriarchate as an institution and its relationship to the Russian Orthodox Church. We Old Calendarist Greeks view the Moscow Patriarchate as an invention of Joseph Stalin in 1942, the product of his decision to change tactics: to stop trying to stamp out the Church completely, which only resulted in the growth of an underground, unregistered church, and to instead attempt to create a state-sponsored church which he could use to rally the people against the Nazis in World War II, and then use as an effective spy agency going forward. 1. 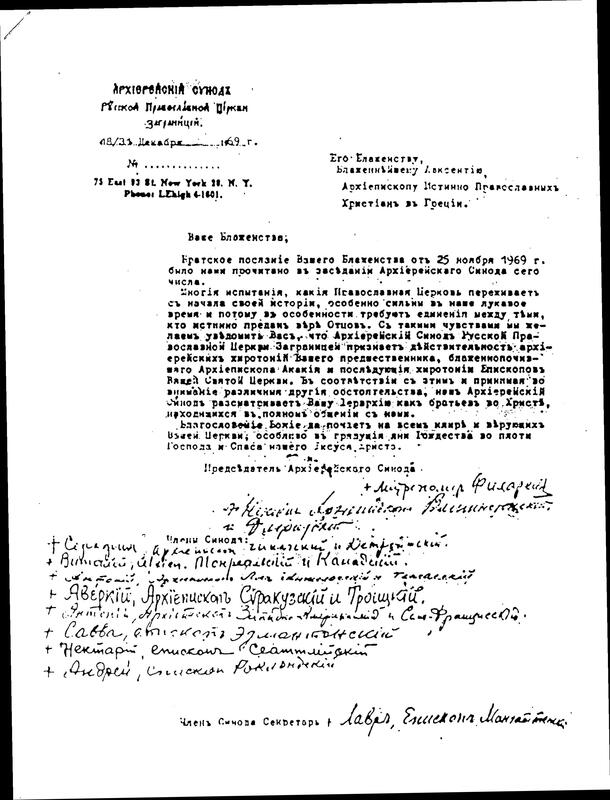 Another phenomenon and movement akin to ecumenism, likewise possessing an ecclesiological dimension, is so-called Sergianism, which, in the unprecedented circumstances of the persecution of the Church in the former Soviet Union, through the agency of the fallen and compromised Sergius Stragorodsky (†1944), originally Metropolitan, and later Patriarch, of Moscow, surrendered to the atheistic Bolsheviks and their struggle against God an outwardly proper Church organization, so that, in the hands of the revolutionaries, it could become an unwitting tool in their unrelenting warfare against the very Church Herself, as the Bearer of the fullness of Truth in Christ. 2. Sergianism is not simply a Soviet phenomenon, for it caused severe damage to the local Orthodox Churches in the countries of Eastern Europe, where, after the Second World War, atheistic and anti-Christian Communist régimes were established. 3. The quintessence of Sergianism is the adoption of the delusion that deception could be used as a means to preserve the Тruth and, likewise, that collaboration with the enemies and persecutors of the Church was the way to ensure Her survival; in practice, however, the exact opposite occurred: the Sergianist Bishops became tools of the atheistic Communists for the purpose of exercising control over the Church, to the end of Her moral and spiritual enfeeblement and with a view to Her ultimate dismantlement and annihilation. 4. At the level of ecclesiology, Sergianism completely distorted the concept of Orthodox ecclesiastical canonicity, since in the realm of Sergianism, canonicity was essentially torn away from the spirit and the Truth of the authentic canonical tradition of the Church, assuming thereby a formal adherence to legitimacy, which could be used to justify any act of lawlessness committed by the ruling Hierarchy; in fact, ultimately, such a veneer of canonicity degenerated into an administrative technique for the subordination of the people of the Church to the Sergianist Hierarchy, regardless of the direction in which it led the faithful. Such a corrupt institution was not the Church of Christ. Some argue that the Greek Church under the Ottoman Empire was in a similar situation, but that’s not really true. It is true that the Ottoman authorities interfered with the selection of patriarchs and bishops, but they left the faith itself alone; they even helped the Orthodox bishops expel Roman Catholic infiltrators among the clergy from the Greek islands after they were conquered in the 16th and 17th centuries, whereas the Soviet State pushed the Moscow Patriarchate to reach out to non-Orthodox, which even culminated in the Moscow Patriarchate communing Roman Catholics officially for some years in the 1960s. 5. After the collapse of the anti-Christian régimes around the end of the preceding twentieth century, the very grave ecclesiological deviation of Sergianism, under the new conditions of political freedom, was preserved as a legacy of the past and, at the same time,changed its form. 6. Anti-Ecclesiastical Sergianism, having long ago incorporated within itself a worldly spirit, unscrupulousness, deception, and a pathological servility towards the powerful of this world, continues to betray the Church, now no longer for fear of reprisals from atheistic rulers, but for the sake of self-serving and secularist motives and under the cloak of supposed canonicity, still peddling the freedom of the Church in exchange for gaining the friendship of the powerful of this world, with all of the concomitant material benefits and, to be sure, prestigious social status. 7. Today, the virus of Sergianism, in this modified form, as neo-Sergianism or post-Sergianism, and also in other forms of state control over the Churches, affects to some degree a large part of the Episcopate of the official local Orthodox Churches around the world, thereby contributing to the promotion of an equally secularist and syncretistic ecumenism, under the cover of a false canonicity. Duplicity is rampant; on the one hand, the Moscow Patriarchate issues soft “condemnations” of Ecumenism, but on the other sends Metropolitan Hilarion (Alfayev) around the world trying to better position the Moscow Patrairchate’s role in the Ecumenical Movement. Respect for other religions is preached, but then more strict restrictions are placed on Eastern Rite Catholics, Latin Catholics, Baptists, and groups deemed “schismatic” by the Moscow Patriarchate (i.e. those who consider themselves Russian Orthodox, but refuse to commune with the Moscow Patriarchate due to its corruption and compromise of the faith). Especially under Putin, the alliance between the Moscow Patriarchate and the State has grown; the Moscow Patriarchate now functions as a virtual arm of the Russian State Department. The reunification of the Moscow Patriarchate with the Russian Orthodox Church Outside Russia (ROCOR) under Metropolitan Laurus in 2007 occurred with the active participation of Vladimir Putin, and the ROCOR’s role in maintaining Russian culture abroad has superseded its previous role as a beacon of Orthodoxy in places where Orthodoxy was being compromised (c.f. 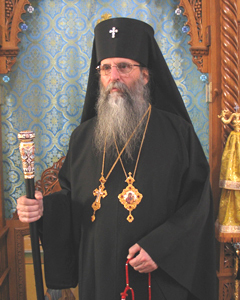 the “Sorrowful Epistles” of Metropolitan Philaret http://orthodoxinfo.com/ecumenism/sorrow.aspx). In fact, when a Moscow Patriarchate bishop, Diomid, attempted to do something about Ecumenism, he was censured by the Moscow Patriarchate, and Metropolitan Hilarion of ROCOR went along with it. 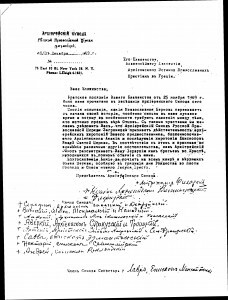 In essence, an institution which is the creation of communists, which compromised the faith of its adherents and the witness of the Church, which never repented once it became “free” and then went right back in to bed with its former master, and which serves as a tool of the Russian State and intelligence services, all the while participating in Ecumenical joint prayers and other excesses, is not the Russian Orthodox Church. Rather than the Moscow Patriarchate, I recommend that those who are Russian Orthodox attend a parish under the Russian Church Abroad under Metropolitan Agafangel, who lives in Odessa, Ukraine, and has bishops and clergy there, in Europe, North and South America, Australia, and in Russia itself. This Synod, deemed “uncanonical” and “schismatic” by the Moscow Patriarchate, is free from the corruption of that institution, and many of its members suffer greatly for being opposed to Putin and his State Church. The confession of faith of these bishops is Orthodox. It must be noted that they have had some internal disputes over the question of Russia versus Ukraine as of late, but seem to have come to an understanding recently at a council. Those are my thoughts on the Russian Orthodox Church. Ordained by a New Calendar Bishop? Based on your research, Is it true that one of the ordaining bishops of Metropolitan Petros was with the “New Calendar but under the ROCOR” like I have read? I don’t celebrate Halloween, out of obedience to my bishop and because my conscience does not permit me to engage in anything that makes light of the dark powers (which, when I was involved with occultic things as a teenager, I witnessed with my own eyes). At the onset, I want to say that I have an extreme dislike for engaging in polemics. Nowadays, I normally do not engage in public refutations of false accusations; I spent too many hours of my life doing so in the 2000s, and it caused me a lot of consternation. Perhaps some good came out of it, but I found it impossible to answer every critic, and every argument. Nowadays, I don’t mind writing broadly in article or book format to address trends and events, but the point-by-point refutation style of responding so common online is something I do not have the stomach for anymore.